While many of you are still waiting for Windows 10 Version 1809 (October 2018 Update), Microsoft is busy working on the next version of Windows 10 – Version 1903 – tentatively scheduled for release in April 2019. One of the features that is currently showing up in the insider version is a setting on Windows 10 Home that allows users to delay Windows Updates. Until now, only Windows 10 Pro and Enterprise have allowed users to delay updates, but it looks like Windows 10 Home users will be able to delay updates when version 1903 is released. This setting allows Windows 10 Home users to delay updates for 7 days. 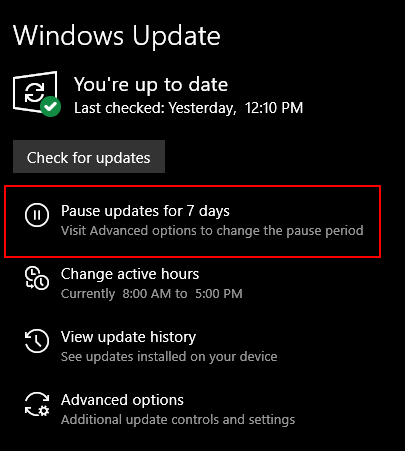 Clicking on “Advanced options” brings up the “Pause updates” dialog, with a drop down menu allowing users to delay Windows updates for “7 days” (according to Microsoft). Yet, as I clicked to open the drop down menu, I showed dates that were quite bit later than 7 days from today ( 08 January 2018). 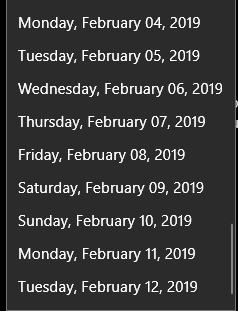 As you can see, the last date is February 12, 2019, which is over a month away. Anyway, it looks like Microsoft is going to have a setting so that Windows 10 Home users can easily delay updates for at least 7 days. But keep in mind that these screenshots are from an insider build of Windows 10 , which is basically a beta version. From experience, we know that features in insider builds come and go like the witches in “The Wizard of Oz”. We’re hoping this new setting that allows Windows 10 Home users to delay updates – remains. It’s something most Windows 10 Home users have been waiting for – let’s just hope we all see it when Windows 10 version 1903 is released sometime this spring. It should be noted, that as of now, after you delay updates and then click “Resume” updates, Windows will immediately check for updates and download and install any updates… and cannot be paused or stopped. We’re hoping Microsoft modifies this. My Windows 10 is still Version 1803. Last evening I attempted to update to Version 1809. My computer ran for about 12 hours and then I got the message that the Update Failed Windows 10 Version 1809 Error 0X80d05001. I doubt I will try it again anytime soon (maybe never). Being able to delay the update is a good thing, I think. I just wish they could be delayed longer than 7 days. I am really worn out with Microsoft jerking people around. Keep at it, as later versions continue to improve. Why delay update, if you can still revert the situation if not satisfied? I’m new to windows 10. Why would someone want to delay windows 10 updates? Windows 10 updates have been plagued with disasters – some updates caused some people to lose personal data, some prevented some users from booting their computers. So many people think it’s wise to wait until the update stable rather than being among the early adopters who sometimes feel like guinea pigs. That’s the why people wanted a way to delay updates. Windows 10 Pro and Windows 10 Enterprise have always had a delay feature. … also since then my office 365 no longer works and it keeps asking for key for it ?? can anyone help me with that ? If this happened within the last 10 days you can go back to the previous version of Windows 10 (1803) without losing anything and it only takes about 20-40 minutes. This is the preferred method because it will correct your problems and you’ll still be able to get the next update (1903) this spring. See our article here showing how to go back to the previous version of Windows 10 without losing anything. If it’s been more than 10 days and that option is not available then you can try running SFC and DISM to fix your problems. See our article here on running DISM and SFC follow the instruction that page and that should correct your Windows Errors (Cortana). Office 365 includes Microsoft Support free – if the above solutions don’t fix your MS Office problems log in to the 365 site with your Microsoft account and you’ll be able to get help for Office. I got the senior pass a few months ago, I tried to get in to schedule a session and it asks for a “key”. I put in the only number that I can find and it is not the right one, I need help, and am quite sure it is Chrom. I am using Firefox I do not know how to disable extenions or add ons. Edge works without all that spinning and timing out. Can you help me? We keep records of all keys, annual passes and SeniorPasses – just type “SeniorPass” when you request a session. We’ll look up your key in our records and resend your SeniorPass info to you. We wrote an article on how to disable and even remove Chrome extensions. You can read that article here. You can also Reset (Highly recommended if Chrome is not working right). Resetting Chrome keeps your bookmarks, keeps your passwords, clears history and disables all extensions. You can read our article on how to do that here. If you need to set up a session with us, go to this page and fill out the session request form.